POTI has been fortunate over the years to have become training partners with other organisations serving the peacekeeping community. In most cases, these partnerships involve awareness campaigns where both organizations recognize and promote the services offered by each other. Other organisations come to POTI asking for our support in helping them promote their cause in even bigger ways. We have a survey we would like your students to answer. Can you help us? We would like your students to participate in a focus group. Can you help us? We have developed a relevant course we would like your students to be able to take. Can you help us? Recently, with the cooperation and partnership of the Accordia Global Health Foundation, through a partnership with the United States Department of Defense, three course supplements were created and distributed to POTI students enrolled in The Conduct of Humanitarian Relief Operations, Ethics in Peacekeeping, and United Nations Military Observers. These supplements incorporated information about HIV/AIDS and other infectious diseases so that peacekeepers were better informed about these important topics if they encountered them in the field. Accordia wished to conduct a short pilot program to study the impact their training material could have if distributed to the peacekeeping community. POTI included questions relevant to the new training material into our current course examinations to help measure the knowledge obtained by the student in relation to the supplementary information. POTI created additional feedback questions related to the new training material that each student was encouraged to answer immediately following their completion of the course examination. POTI provided examination statistics, feedback form summaries, general student demographics, etc. to aid Accordia in their study. POTI created its own analysis of the impact of the course supplements and provided results to Accordia after the study period ended. 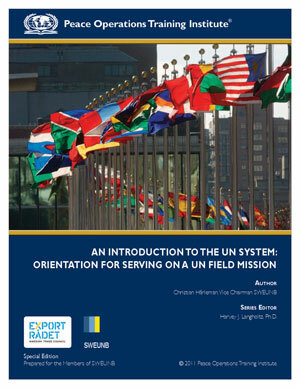 The Swedish Association for UN Business (SWEUNB) asked POTI to work with them in developing a special version of our An Introduction to the UN System: Orientation for Serving on a UN Field Mission course. This special edition would be available from within our online classroom, but only to members associated with SWEUNB. SWEUNB was able to take advantage of our online classroom system to distribute customized training on their behalf - saving them huge amounts of money in developing a system with similar capabilities.